Yep, we have just launched our action against the Victoria Police in the Victorian Civil and Administrative Tribunal. We’re seeking an order that they reveal ‘recommendations’ they made to the Victorian State Government to have our gun laws changed, which they don’t want anyone to see. The principle behind this action is simple: Victoria Police does not belong in the policy space. 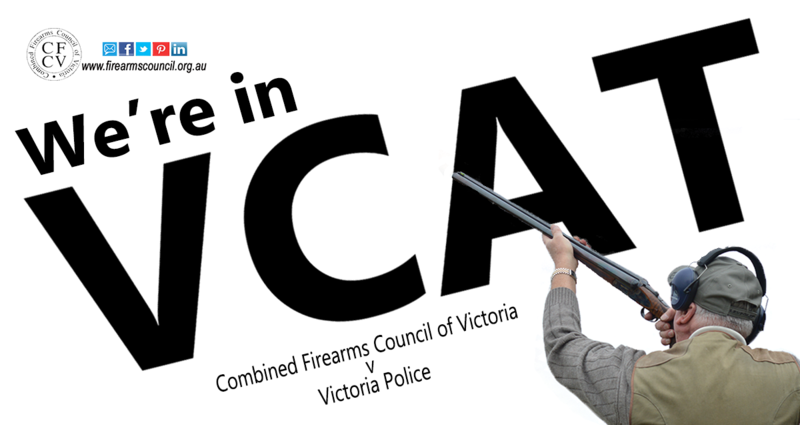 The background to this matter was published in our earlier blog where Victoria Police refused to comply with our FOI request to handover documents outlining their grand plan for firearm law reform, which they provided to the government. In legal lingo, they are hiding behind the protection of their documents being “Cabinet-in-Confidence”. That protection is normally available to departments, whose job it is to prepare confidential briefings and analysis for Cabinet, through their minister. We’re arguing that this exemption is not available to the Victoria Police, because it is not a department (but an independent regulator) whose functions are spelt out under the Victoria Police Act 2013. Those functions relate to enforcing the law, not making it. We think their defence is little more than a ‘middle finger’ to the shooting community who are entitled to be part of a broader consultative process, rather than be at the receiving end of games being played ‘behind closed doors’. That’s why we’ve decided to throw everything at this we can. We’re running a call for donations to help hire the legal help we need to try and make this action a winner. For this, we’ve engaged Avi Furstenberg from Furstenberg Law (as our lawyer), and Robert Cameron (our barrister). Both were chosen for the way they have engaged with us and their passion for the law and just legal outcomes (reminiscent of ‘The Castle’!). We’re grateful for their help and friendly advice to date and look forward to seeing where this takes us. More than 200 of your colleagues have chipped in to help pay the bills and we really appreciate the help they are providing. If you’d like to be among them, then you can do so now – it’ll be money well spent to fight an important legal principle. If you have already donated, thank you! You’re why we’ve been able to get this action going. Thank you again for your help! Don’t forget to follow our Facebook page or click here to jump on our email list, for updates as this rolls on. Let’s hope Avi and Robert can weave their magic and pull a win out of the hat for us. This action doesn’t come without it’s risks. They include losing the action and having VicPol’s costs awarded against us. Actions in VCAT are normally on the basis that each party bears their own costs and the chance of that not being the case is ‘highly unlikely’, but it is a risk nonetheless. There is also the risk that if we win, Victoria Policy may try to appeal the ruling to the Supreme Court. Or if we lose, it could be us who appeals to the Supreme Court. Then again there’s the upside of winning – and finding out what the Victoria Police have been cooking behind our backs. Got a club meeting coming up? If your club would like to have someone from the CFCV to come along to one of its meetings and talk about the action, let us know by email by clicking here. Thank you to the CFCV this is the best thing in a long time that has happened for the shooting community. We’re still stunned it has to take a group of individuals such as yourselves with limited membership and associated funds to stand up for us where there is one particular organization that has remained very, very quiet. You’ve already received one donation from me, but rest assured it won’t be the last time. I’ll be regularly tipping in to support you. Most acts after 1975 are invalid. All acts must be stamped with the seal of royal ascent. Check to see if the act you mentioned above has the proper seal. If it doesn’t, the act is worthless. Great work. If you have not donated yet. Do it now. These guys need and deserve our help. If not now. When? Just donated $20. Good luck! Thanks Anon. I doubt that will happen. It would mean the government would have to bump DOJR to one side as the briefing entity and no government (nor DOJR) would allow that. Mike, if you check the list of member organisations at the top of this page you might find enlightenment about a certain organisation that is taking a bit of flack from uninformed people. We need unity to combat the problem, anything else is counterproductive. We may have an infiltration problem, dirty tricks are common in politics ! good news-you chaps have done this sort of thing before ! !